Overview: Exam Gown, XLarge, 36" x 45". Blue. Scrim reinforced. Sewn shoulder, sewn neck tie. Strong material made of tissue, reinforced with matrix of sturdy filaments. Longer length for added modesty. Sized for large patients and/or for use where added comfort and extra modesty is desirable; pre-natal, sports medicine, obesity clinics. UOM: CA. Packaging: 25/CA. Polyethylene layer for increased protection. 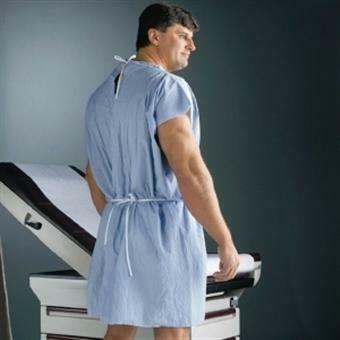 Poly gowns are reversible for total flexibility.